I have been struggling hard for writing IUPAC naming of this compound. Anhydride with benzene having five membered ring can be named as benzene dicarboxylic anhydride and five membered ring without benzene can be named as pentane -1,5-dioic anhydride. But what can I do for this compound? It looks like a isochroman-1,3-dione to me. For preferred IUPAC names according to Nomenclature of Organic Chemistry – IUPAC Recommendations and Preferred Names 2013 (Blue Book), cyclic anhydrides are generally named as pseudoketones. For example, the preferred name for succinic anhydride is oxolane-2,5-dione. For the parent structure of the compound that is given in the question, the retained name isochroman, which was used in previous editions of the IUPAC recommendations, is still acceptable in general nomenclature – even with full substitution, including characteristic groups expressed as suffixes (see Subsection P-31.2.3.3.1). Thus, the name isochroman-1,3-dione is acceptable in general nomenclature for the complete compound that is given in the question; however, it is not the preferred IUPAC name. The preferred IUPAC name for unsubstituted isochroman is the systematic benzo name 3,4-dihydro-1⁠H-2-benzopyran, which can be directly derived from 1⁠H-2-benzopyran. Likewise, the preferred IUPAC name for the complete compound that is given in the question can be derived from 1⁠H-2-benzopyran by introducing the two principal characteristic groups of the pseudoketone as ‘1,3-dione’. However, this change requires the addition of another hydrogen atom, which must be cited in the name. The presence of at least one hydrogen atom on a ring atom that is attached to adjacent ring atoms by single bonds only that results from the introduction of a principal characteristic group, a free valence, radical, or an ionic center into a mancude polycyclic system in the absence of, or lack of, sufficient hydrogen atoms, is cited by using the capital italic letter H following the locant of the ring atom for each such position. This ‘added indicated hydrogen’ designation is enclosed in parentheses and inserted into the name immediately following the locant(s) for the free valences, radical or ionic centers, or principal characteristic groups. Therefore, the complete name for the compound that is given in the question is 1⁠H-2-benzopyran-1,3(4⁠H)-dione. IUPAC nomenclature: “Smallest sum of locants”? 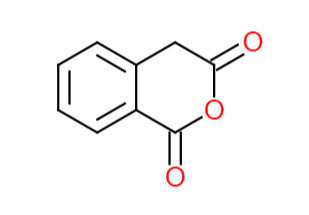 Preferred IUPAC names for branched unsaturated hydrocarbons (polyenes)?